An RFID chip itself is useless if your registration isn't submitted and then kept current. 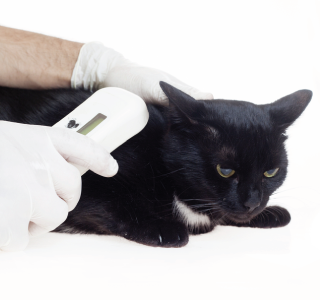 At 4 Paws Veterinary Care, we register the microchip for you so you don't need to worry about this extra step in order to ensure your beloved feline friend can be accurately identified with his or her pet microchip. It is a great idea to invest in a collar ID tag for your cat. Collar ID tags are the first line of defense in locating and identifying a lost animal. For example, if a neighbor finds you lost cat, they will not likely have a microchip scanner and will simply rely on the collar ID tag. However, microchipping cats is the second, and in some ways most important, line of defense for your cat. This is because microchipping cats ensures that your pet's identification is never lost, stolen, removed or compromised.